My son is such a big fan of anything trucks especially construction trucks. I was thrilled when earlier this year I won the book Demolicion (Spanish Edition) in a giveaway hosted by Spanglish House. Since then this book has been a favorite in our home. I love that the book is in Spanish, and great for early Spanish literacy. Big plus for my up and coming Spanish reader! It’s colorful, and with descriptive words showing the process of demolition all the way to recycling the materials. I enjoyed the book very much but unlike the English version that has a “Machine Facts” page this one didn’t have one. So I had to look for the translation of all of the construction trucks, and since I went through so much trouble 😉 I went ahead and made a free printable for you to enjoy! 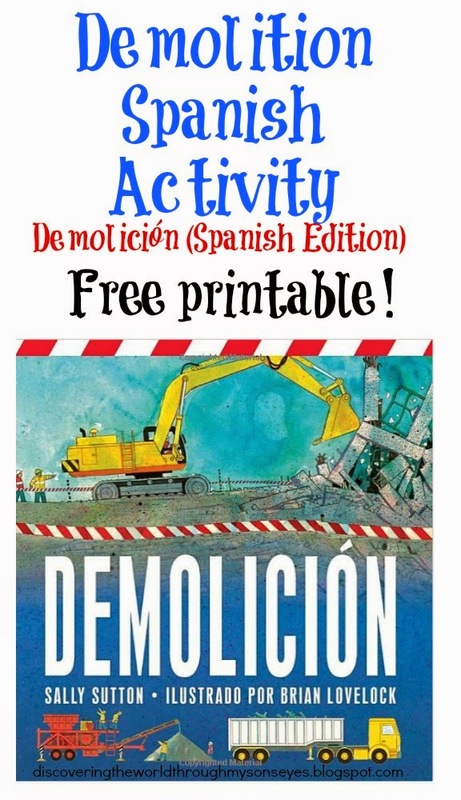 Free Spanish Activity Printable – DemoliciónI hope you and your child enjoy the free printable! This is one of our favorite books! Thanks so much for sharing this resource. What a great printable! Thanks for sharing this post at the After School Linky! Next Post: Happy Birthday U.S.A.!